This guide will help you find the best downrigger for your needs. Whether you’re targeting Salmon or Sailfish, getting you’re lures in the strike zone is key. Changing the presentation, or finding the thermocline can make all the difference. First we’ll go over the characteristics of downriggers. Then, we’ll review the top picks. Let’s get started. While a downrigger may sound overly complicated, at its heart it’s just a method of getting your bait deeper. You’ll also need to retrieve the rig when you’re done. Keep that in mind as you consider the parts of a downrigger. Understanding each part of the downrigger will allow you to make a better decision on what model best serves your needs. This is not a standard fishing reel. It is generally just a large spool capable of holding several hundred feet of cable. The cable will be unrolled to lower your rig to the desired depth. It’s important that your reel is strong. They’re usually made with a high-density polymer or aluminum. Both are generally good. Steel is a third option that should be considered closely. However, unprotected steel is likely to corrode in saltwater. If you are running deeper than 400 feet deep, getting line in quickly and back in the water should be a big consideration. All manual and some electric downriggers have a hand crank to manage line retrieval. Some are geared while some are directly mounted to the reel. You are always better off with a geared system that exponentially improves retrieval speed. On an electric unit, this is usually just a backup should your battery run dead. This would be the ‘pole’ of the downrigger and is generally short and thick. There is no casting so this only aids in getting the rigger cable away from your boat so it can do its job without interfering with other operations. Material is usually aluminum or fiberglass for strength. Either work well but fiberglass is notably lighter and has a little flex to it. The flex can help ease strain on the line and reel. When you think of a clutch, you usually think of something that has to do with power transfer. While this is this case with a downrigger clutch, it isn’t that intuitive. The clutch isn’t on the power system, it’s on the line brakes. This helps you stop your rig when you want to but not so quickly that there is a sudden jerk. The last thing you want is that kind of force transferring to your downrigger arm. The point of contact where the downrigger meets your boat may be the most critical factor to consider. It needs to be a strong connection point that is suitable for the space you have available on your gunwale. It should also have the ability to swivel so the movement of any rig in the water is stable and natural. Some downriggers have a quick attach base that will stay with the boat. This allows you to store the costly portions of the rig. Most people find this a great security feature. A downrigger, more often than not, will have an attached rod holder. These are usually a simple, bucket-style affair but serve their purpose. Having the rod holder mounted on the unit keeps it aligned with the cable and rig. The idea is to prevent the baits from being released from the downrigger system before they are taken off by a fish. Some downriggers have a hookset feature that will spring the pole vertical when a fish takes it. This is preferable when you can get it, otherwise you will need to keep a close eye on your pole. Most downriggers are pre-equipped with a heavy weight. This is usually a lead ball that will get your rig to the depth you want. There is not a lot to choosing the right weight, you can always add more if needed but it’s very hard to get too much. You aren’t bottom bouncing or any other fancy tricks, it’s just enough to get and keep your rig where you want it. The release on a downrigger is a pre-fitted quick clip, the exact kind may vary. The entire job of the release is to hold the line feeding to your actual fishing setup until a fish hits your bait. At that point, the line should be freed from the downrigger. While there are several styles, all seem to work decently. As long as they’re secure and can hold the bait until it’s your turn, you are in the clear. Nearly all downriggers use a stainless steel wire. They’re often an alloy such as 316 or a similar. You want a flexible, strong, and corrosion resistant choice. The line on a downrigger, if properly cleaned, protected, and cared for, will last forever. Replacement wire is available but you should be cautious to choose a line that’s suitable for your downrigger. While not all downriggers have a line counter, this is one feature you should strongly consider. If you’re targeting specific depths, you can always pre-mark your line. But it is far simpler to have a line counter pre-installed. They are far more accurate and easier to use than any other method. Once you have used a line counter, you will be sold for life. Manual Vs Electric Downriggers – Which is right for you? While it may seem electric is overdoing it a bit, there are ample reasons to own an electric downrigger. The cost difference between mid-range units is small. This has made increase in popularity. That isn’t to say there aren’t times you would want a manual over an electric. Let’s explore them both and their strengths and weaknesses. For the most part, manual downriggers are smaller, lighter, and more cost effective. Many come with line counters, have clutch brakes, and work exceptionally well. They are much less complicated to use and can be ran on boats of most any size. There are even models that can be used by kayak anglers. They are slower to retrieve and can wear you out if you are fishing deep. 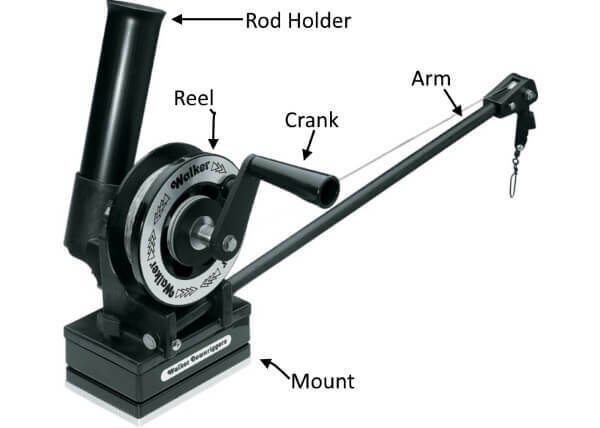 The smaller crank can do a number on your arms and hands over the course of a day and will slow the action down. You only catch fish when your baits are in the right place and minutes matter. This is even more important if you fish alone. While you may spend more on an electric model than a manual, the benefits are justified for most users. They are significantly faster and can be ran by just one person. It’s easy enough to grab the rod on a hit. Then, activate the retrieve button so your rig is at the surface while you are fighting your fish. The line is out of the way and ready to setup again without delay. Electrics will usually have all of the features on a manual including clutch breaks and line counters. But they are larger, heavier, and harder to mount. They can also be a little more complicated to learn but nothing you can’t figure out with a little time. An additional feature you will commonly find on electric downriggers is Positive Ion Control. This is an interesting little add-on that polarizes the steel cable to attract fish. While it’s debatable as to how effective this is, there is some science to back it up. Regardless, if it has a chance of getting you a few more fish, it’s probably worth it! Might not fit well on a small boat. If you have opted to get an electric downrigger, you are going to need to power it. This means either a boat with the extra battery capacity or a backup battery. While this is often a consideration left off by most people, it’s something you need to think about up front. If your boat can’t handle it, don’t get it. Batteries are not cheap but a good deep-cycle battery will last through many charges. A downrigger doesn’t use that much power. It has a small motor that is only ran intermittently for a few seconds at a time. Running one off your boat batteries is usually easy enough. If you are running a small boat, adding a second battery is generally advisable. You can put this on a kicker with your main battery or dedicate it to your downrigger. Whatever you do, you just want to ensure that you never run your battery down and get yourself stuck. In a bigger boat, you often have plenty of extra battery capacity. You have the option of using an external battery. Another option is to wire in a plug for your downrigger. It is always safer to wire in a plug but this can be complicated and difficult while getting a pro to do it is expensive. The best method of all is a blend of both by adding a dedicated power source for your downriggers and having it wired in. This is expensive but it allows you to have a dedicated power system that does not pull from your boat’s needs. It is also safe and efficient. If you are looking for a no frills, perfectly usable manual downrigger, you can get everything you need out of the Cannon Uni-Troll. It is built to be rugged, dependable, and easy to use. It’s a great choice for those looking for precise depth placement without spending a ton of money. This is one of many options offered by Cannon and perhaps their best-selling. When it comes to basics, the Uni-Troll has a geared retrieval mechanism. It gets line in faster than any similar unit. It is nearly as fast as an electric unit. Of course, it still takes muscle to get it done but not as much as most cheap downriggers. Depth control is quite accurate using the integrated line counter. It also comes with a one-hand controlled clutch. The boom extends as much as 53” to keep the wire well away from your boat. The adjustable rod holder can be positioned for perfect placement. No matter how your boat is set up, you can have your rod easily to hand when the action happens. The simple bolt-down base is interchangeable with most Cannon downriggers. This includes their electric models. This makes upgrading in the future easy once you are hooked on how well a downrigger works. Everything important about the downrigger is easily removed and installed in seconds. When you need it, it will be securely mounted on the base. The Uni-Troll comes pre-loaded with 200 feet of 150 lb. test stainless cable and is rigged and ready to go. Total installation time is just a few minutes and uses minimal tools. You can get this in the mail in the morning and be fishing by early afternoon. It even comes with the Canon limited lifetime warranty should something unexpected happen. 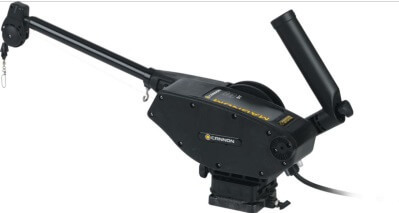 For one of the best budget electric downriggers, we return to Cannon. This time with their exceptional Magnum series. On a budget, the 5 ST is king. Upgraded units are available if you need more than what this amazing, compact unit offers. It may lack the high end features but it has everything a one-man operation needs. For getting lines down and back quickly, the Magnum 5 has a total of 250 feet per minute retrieval rate. This can put you at maximum depth and back in just a couple of minutes. If you want to keep your line in the water, this is what it takes. It even has a short-stop safety so that speed doesn’t pull the weight up to the arm and cause any damage. The arm extends to just over 50” and is a fully-coated steel construction for maximum strength. The Magnum comes loaded with 250’ of 150 pound test steel cable. The cable is both saltwater resistant and camouflaged. A mechanical line counter will help you get your lures in the strike zone. Then, a single button press will bring the line all the way to the surface. The base of this unit is the same used on the Uni-Troll above. It features the same easy mounting and quick-attach system. Setting up the electric unit is not more complicated than setting up a manual unit if your wiring is already set. You can still be up and running in less than an hour. Electrics on a boat are always a concern but the Magnum series are all IP68 Waterproof with saltwater resistant construction. If you want to pay more, you can get more features but are not likely to find a tougher unit. It is even backed with the same warranty as their manual units to prove it. Single Button Retrieve W/ Safety Stop. Easy to Mount and Setup. Fewer Features than other Electric Models . Scotty is one of those names that should be well known when it comes to fishing accessories. They have become popular enough to be a feature on many boats, kayaks, and other watercraft. The Scotty Depthpower can still go from a full dept of 250’ to the surface in just over a minute. This is done with a single button press so you can worry about the fish while Scotty brings your rig back to the surface. The Depthpower is pre-rigged and includes a 250’ steel cable, weight, and release. The construction is spot on for the needs of any salt or freshwater angler. The boom extends up to 60” and is made of a high-strength, low-corrosion steel. The electronics are sealed and waterproofed. All you have to do is wire it and you’re ready to go. It even has an included plug and receptacle to make this easier. 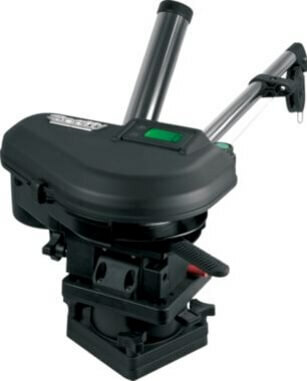 The Depthpower is the first of these downriggers to feature a swivel base. This will help contend with any spread requirements you may have or just to get it away from the boat. This does make mounting a bit trickier but nothing a few minutes and some simple tools won’t sort out. This downrigger is small enough for most smaller boats but big enough for any larger craft. A novel feature on the Scotty is the adjustable speed retrieve and lower battery usage. You can get this particular downrigger setup to use as little as 1/3 the juice as most competitor’s models. This means more time fishing. Any way you look at it, this is an amazing downrigger for the money. When you find a company that has focused their business on making downriggers, you can count on them knowing what they are about. Walker makes downriggers and accessories and makes them well. They are designed to be effective, affordable. They’re capable of handling any level of use up to commercial charters. While in some ways, this is scaled back in features over the Scotty Depthpower, it is an overall superior unit but with a superior price tag as well. One difference is the use of aluminum in the 3’ fixed arm rather than steel. While this isn’t as strong, it is far more resistant to rust and corrosion. You will have to show a little more care in its use but it will last forever otherwise. Retrieval is exceptionally fast, on par with any of the fastest downriggers on the market. It can easily bring in the heavy-duty 190 lb. steel cable in under a minute, all 200 feet of it. They’re geared toward saltwater users. But will work just as well in fresh water and last even longer. Of all electric downriggers, this has one of the smallest overall footprint. The size was reduced by mounting the retrieval mechanism in a more vertical orientation. This makes the unit appropriate for craft of many different sizes and those with limited room on the transom. The base even swivels to get a good orientation and make it easier to store. Overall, this is a very solid unit with all the extras you could want. It has positive-ion fish attraction, a mechanical line counter, and single button retrieval with safety stop. It comes with a nice, flashy chrome rod holder that is adjustable to fit any rod configuration. For the money, you won’t find a unit made to last as long or run as hard as the Walker Kokanee. Commercial Quality & Durability . To find the king of all consumer-grade downriggers, we come back to Scotty. 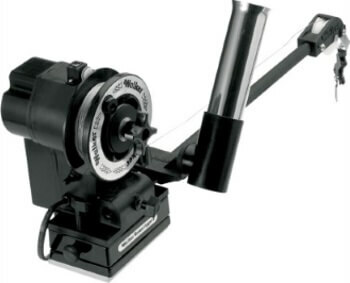 This is a downrigger that easily tops out some professional and commercial systems. But you won’t pay commercial grade prices. If you have the money to spend, this is where you spend it. Starting off at the top, this unit ships with 300 feet of pre-rigged stainless steel cable. The cable provided is specifically designed for downrigger use. This is one of the highest capacity machines out there and to make your life easier, it uses a single button to send your line both up and down. To do this, you can set the depth you want to run and the brain inside the Scotty will send your line straight to that depth. Combine that feature with the super-fast speed. 295 feet per minute, means you can spend all your time fishing and very little messing with the downrigger. 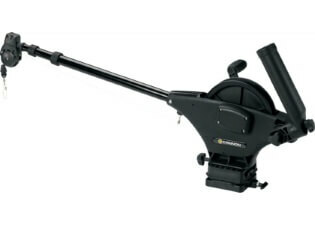 The downrigger arm extends out to 60 inches, keeping your line far from your boat and is made of marine grade steel. Everything about the high powered Scotty is made to be efficient. The pedestal is a little high but the mounting bracket itself is quite small and compact enough for use on smaller boats. It is still strong and resilient for years of use. The 2106 can be swiveled and locked at 16 different positions. Instillation of the hardware is easy and can be done with limited tools in just a few minutes time. What pushes this unit over the top is the inclusion of several high-value features. One is the drive belt which is made by the same company that makes belts for high-performance supercars. The second is the largest clutch in the industry to keep your downrigger safe. Finally, features like auto-stop, auto-retrieve, and depth memory make this a perfect unit. It’s suitable for a one-man show or even charter operations. Fast Single Press Retrieve w/ Auto Stop. Remember that downriggers are usually used in multiple arrangements. This will help you plan out your budget. Being able to spread several baits at depth is a common tactic. Also, don’t forget to think about how your boat will need to be modified for mounting. If you have any questions, please leave a comment and if you enjoyed the content please subscribe to my newsletter.